When the Chinese began to develop their first generation YW-531 series armored personnel carriers, they took a look at other nations (mostly the US and USSR) and also created a “high-top” variant. 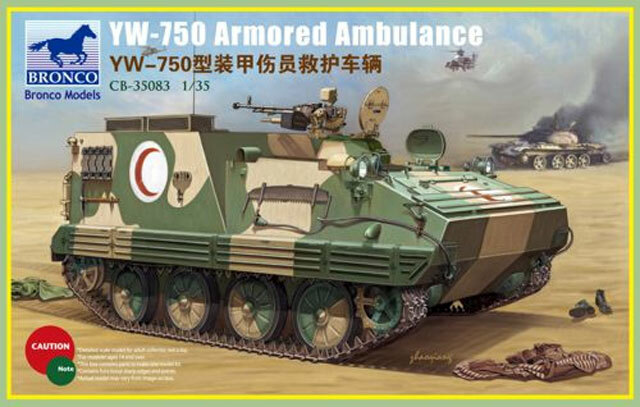 This was developed along two different lines, either as a command post vehicle (YW-701 series) with view ports in the casemate section, or an armored ambulance (YW-750) without them. Other than the viewers, the two vehicles are nearly identical and appear the same at battlefield ranges. The ambulance is therefore expected to be marked with medical insignia, either the more common Red Cross or the Red Crescent. What is NOT expected is that one of the options for this vehicle is a heavy antiaircraft machine gun mounting on the top of the casemate. Ambulances are generally considered to be off the target list by most nations but as there are those who ignore that nicety the Chinese cover all bases. As a result it mounts the rotating cupola for a 12.7mm Type 54 (Chinese version of the famous Russian “Dushka” machine gun) this time at the commander’s station. 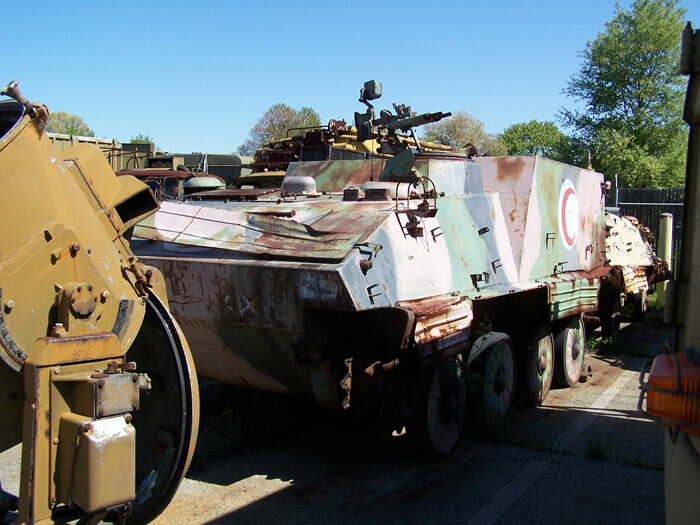 This vehicle was sold to several foreign customers that had purchased the YW-531, most specifically the Iraqis who made large purchases of the YW-531C model. They dubbed the YW-531C as the BTR-63, but both the later command vehicles (YW-701) and ambulances (YW-750) were designated the BTR-63-1 vehicles in their service. The 203rd MI Battalion has one YW-750 at Aberdeen Proving Ground which was brought back from Iraq. Bronco decided (wisely) to release all three variants of the basic YW-531 vehicle in kits; this is the YW-750 variant, and is very similar to the YW-531C kit other than the new upper hull, rear plate and some minor parts. As with the other Bronco Chinese vehicles, it is hard to find and I actually ordered this one from a hobby shop in Tianjin, China! Considering all YW-531 variants are relatively small vehicles (this one is much smaller than the US M577 series vehicles) it has a surprisingly large number of parts. Some are incredibly tiny (e.g. the individual bolts used to attach the spare track links to the hull) and are going to be very frustrating to deal with when installing them. But the biggest surprise is that while all of the hatches are all designed to operate with scale hinges, other than a single jump seat on the rear hatch there is not one whit of an interior; too bad here, as it needs some stretchers in that yawning cavern at the rear! As noted with the YW-531C, assembly is pretty straightforward and the directions – while point and stick – are clearer than some. As with all armored kits, assembly begins with the suspension and lower hull. Wheels are two-piece with thick backs to give the right look and all are designed with styrene keepers to rotate, even though the directions indicate they are to be cemented in place. 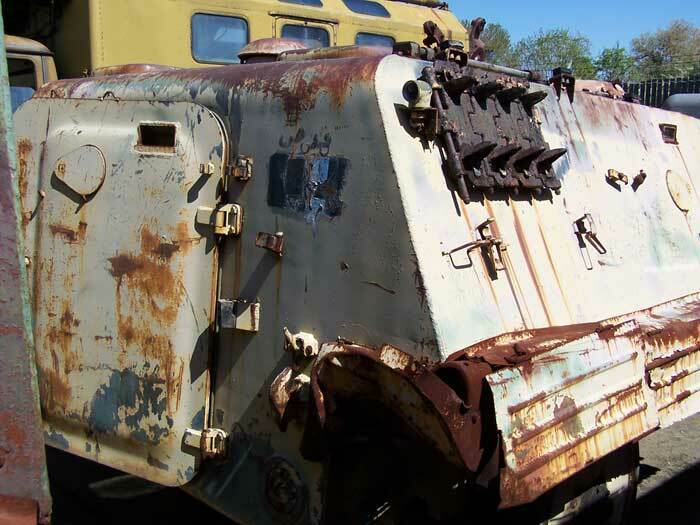 The tracks need a magnifying glass to sort out – they are handed left and right, assembling hinges upward when viewed from the front and with the bolt heads towards the outside of the vehicle. 96 links are provided for each side but there is nothing to say how many are needed per side (from the directions there will be extras). Bronco shows them as snapping together but I am not sure if the nubs are sufficient to hold the links together without cement. The fenders require etched brass brackets to be added to mount the side skirts. The finished assembly mounts as a single piece in Steps 11 (left) and 12 (right). The directions note many parts are not supposed to be cemented in place, such as the engine deck (B24) and engine access hatch (B7), but as noted all they do is permit you to lift off the hatches to show the lovely empty hull! Ditto the hatches which are each installed with very petite hinges and are suggested to be left loose to open to again show empty space. The Type 54 machine gun consists of 18 parts and is nicely done. But then Bronco has you attach it to the cupola which has a two-piece hatch cover; this kit shows it either open or closed, so they appear to have fixed the directional error from the YW-531C kit. The rear hatch consists of 13 parts and also permits the jump seat to move, and may be shown either open or closed. But again, no interior other than that jump seat. The only name listed for reference is Phil Greenwood, but he doesn’t seem to have a very good idea about the actual history of the vehicle and its problems. Most of the tiny blurb here is for the YW-701. Two finishing options are provided, both for Iraqi vehicles: one is sand with Red Crescent markings and one is green and sand with Red Crescent markings. No unit markings are provided. This is a shame, as they were very common vehicles and used by nearly all of the armored formations. Overall, as with the YW-531C, this is a really nice kit and perfect for Desert Storm fans. Hopefully someone will come out with after-market markings, however. NB: Attached photos are of the 203rd MI BN vehicle, which is apparently marked for the 51st "Saddam Hussein" Mechanized Division and sports a three-color scheme.